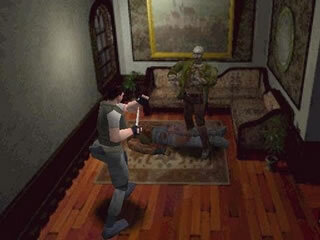 Resident Evil was an excellent third-person action shooter which sparked the videogame survival horror genre into life. 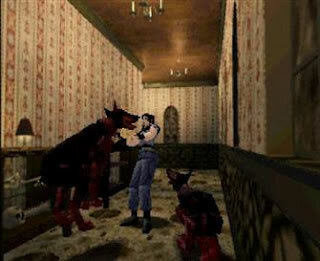 It featured a creepy atmosphere and a variety of zombies and bizarre monsters for the player to overcome. Predominantly an action shooter the game also featured a few puzzles to solve. It was first released for the Playstation in 1996 and cast the player in the role of a Special Tactics and Rescue Service operative (understandably shortened to S.T.A.R.S. in the game). You could choose to play as either Chris Redfield or Jill Valentine and each character had slightly different abilities and unique overlapping scenarios which made for great replay value. You began the game in the main hall of a creepy mansion. Sent in as part of Alpha team to try and find out what happened to Bravo team (you’d think Alpha team would be sent in first but never mind). The opening of the game was beautifully done and as a gunshot rang out you got control of your chosen character for the first time. Loading screens between rooms in the map were cleverly masked by a door opening animation which served to heighten the tension as you held your breath in fear of what you might find on the other side. I’ll never forget my first zombie encounter in Resident Evil, it was a true highlight of my gaming life. As I searched for the source of the gunshot I entered a corridor and could hear the faint crunching and squelching of someone eating. Walking slowly up the corridor the source of the sound was revealed to be the corpse of my fallen Bravo team comrade being eagerly ripped apart and eaten by a hideous zombie. As he turned toward me with blood dripping from his gaping maw I back-pedalled in horror and filled him with enough ammunition to fell an elephant, maybe even a zombie elephant. At the time the graphics in Resident Evil were breathtaking and the zombies were skilfully modelled and animated. The game featured then unsurpassed high-poly character models, detailed textures and impressive particle and lighting effects. The fixed camera positions also made the most of the 3D environment and the artful direction helped to increase the sensation of playing through one of your favourite horror movies. There were a number of different creatures to fight from flocks of crows to a man-eating plant and even a shark and while they helped to introduce some variation into the game-play the real stars of the show were definitely the zombies. They were the same shuffling breed of flesh eaters that featured in Romero’s classic living dead films and while they were slow moving you had to be careful not to get too close or they’d grab you and chow down. You’d think slow moving zombies might not provide much of a challenge but the game-play mechanics were clever and had several features which increased the general level of tension. While individual zombies could be overcome or avoided quite easily you would often come across hordes of them. The combat was made more challenging by the limited ammunition available and the frighteningly slow reload and fire rate on most of your guns. Most of the difficult choices in the game came from the limited inventory slots; your character could only hold a certain number of items although you could find chests around the mansion in which to save items for later use. Resident Evil also featured a great save system which kept you immersed in the game world. You had to collect typewriter ribbons and could only save your progress if you found a typewriter. Since the ribbons were limited you had to ration them carefully and make tactical choices about when to save. The game-play was linear and you had to work your way through a series of connected rooms and corridors clearing up the horrors that lay within and solving the mixture of simple and irritatingly difficult puzzles that blocked your progress. It was a very challenging game made when developers were still allowed to produce games difficult enough to have you on the verge of throwing your controller at the screen in frustration, something that publishers have gradually forced out of gaming. For all its brilliance there is no doubt Resident Evil had flaws. The worst thing about the game is the diabolical voice acting. It was originally a Japanese title called Biohazard and I don’t know where Capcom found their voice actors for the western version but they are unbelievably bad. It’s also fair to say that the script features some terrible lines of dialogue and I can only assume that something was lost in translation. The control system was always a little awkward and while the fixed camera angles were great for heightening the horror they could be very annoying especially when you knew a zombie was lurking in wait on the next screen but couldn’t see him. There were also some frustrating puzzles and the need for careful inventory management could become tiresome after a while. Still none of the flaws were particularly serious and they certainly didn’t stop the game from enjoying massive success and spawning a series of sequels and film adaptations. When I first played Resident Evil it was easily the scariest gaming experience I’d ever had. From the grotesque monsters and zombies to the rotting and decayed creepy mansion the game just oozed with chilling atmosphere. Survival horrors have become popular in gaming since then but I’ve yet to play anything that had the same impact on me as this enjoyable zombie-fest. Of the true survival horror games, this one is still my all-time favorite. Despite how it’s aged in graphics and controls, I still love the design of the mansion, and I feel that the environments have never been surpassed in the Resident Evil series. I definitely agree with the impact it had, nothing ever creeped me out like this game did the first time I played it.